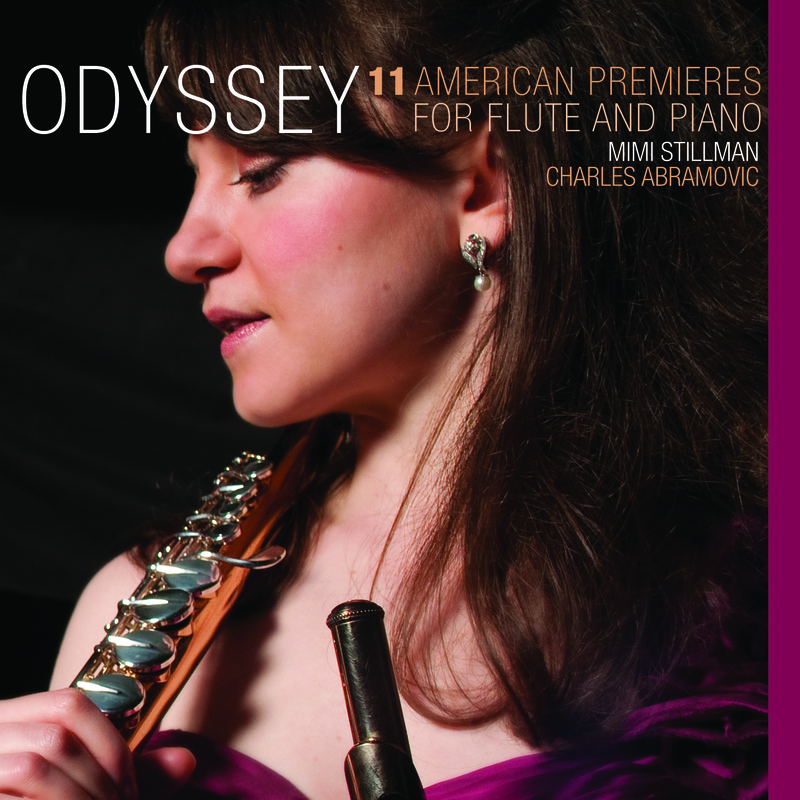 Odyssey: 11 American Premieres for Flute and Piano is the latest release from flute superstar Mimi Stillman. This 2-CD collection, with pianist Charles Abramovic, is a breathtaking tour de force that brings together nearly a dozen works – mostly written for Ms. Stillman – highlighting the richness and diversity of the American contemporary music scene. Odyssey takes its title from the work by Gerald Levinson, and more broadly, it is the adventurous journey representing the recording as a whole. There is stunning breadth and variety of musical styles from eleven composers of different compositional languages and approaches. Mason Bates’s Elements is a virtuosic essay from a composer who is as comfortable in electronica as he is as composer-in-residence for Chicago Symphony. Benjamin C.S. Boyle’s Sonata-Cantilena showcases the vocal nature of the flute in lushly sensuous writing. Gerald Levinson’s eponymous Odyssey is a 15½ -minute monster of a piece for solo flute, a test of stamina and control. David Ludwig’s Sonata features two outer movements which are fast rides with inexorable momentum propelling flute and piano, surrounding a lyrical, introspective inner movement. Odyssey draws on music of diverse world cultures - David Ludwig was inspired by traditional Argentinean music, Katherine Hoover by Hungarian, American Indian, and Chinese music, Michael Djupstrom by a Balkan folk song. Zhou Tian references his own heritage of Chinese music. David Bennett Thomas cites jazz as an influence on his Whim for Solo Flute, along with elements of Messiaen. In her Mountain and Mesa, Katherine Hoover quotes a Hopi lullaby recorded by an ethnomusicologist. Grammy Award winner Richard Danielpour’s “A Quality Love,” Stillman and Abramovic’s arrangement of an aria from his opera Margaret Garner, is a poignantly simple song of love in a folk-like vein. Hailed by The Washington Post as “a magically gifted flutist, a breath of fresh air” and described by Broad Street Review as “lyricism combined with introspection, fire and energy,” Yamaha Performing Artist Mimi Stillman dazzles audiences with her virtuosity, passion, dynamism, and “full-toned charisma” (The Philadelphia Inquirer). The New York Times praised her as “technically agile and imaginative in her use of color.” Philadelphia City Paper marveled at her “rock-solid chops and affecting conviction.” She has performed as soloist with The Philadelphia Orchestra, Bach Collegium Stuttgart, Orquesta Sinfónica Carlos Chávez, and other orchestras and as recitalist and chamber musician at Carnegie Hall, The Kennedy Center, Verbier Festival, and other major international venues. Mimi Stillman is a Renaissance woman – consummate artist, entrepreneuse, historian, writer, and educator. A child prodigy, Mimi was at age 12 the youngest wind player ever admitted to the Curtis Institute of Music, and at 17 she became the youngest wind player ever to win the prestigious Young Concert Artists International Auditions. Equally at home with the classical canon, contemporary music, and Latin and Sephardic world music, she has performed with Paquito D’Rivera, recorded a film score for Kevin Bacon, and was given a long standing ovation for her brilliant performance with Charles Abramovic of the complete flute chamber works of Bach. She is Artistic and Executive Director of Dolce Suono Ensemble, which she founded in 2005, a highly regarded pioneering force in the music world that has produced 23 world premieres in seven seasons. "This is a fantastic collection of new works for flute, beautifully played by Mimi Stillman and Charles Abramovic. I rarely say this, but I think it's a MUST HAVE!" "This is one terrific set. Flutist Mimi Stillman and pianist Charles Abramovic, cofounders of the Philadelphia-based Dolce Suono Ensemble, are ideal chamber music partners -- each superb players in their own right who breathe and feel and sing together with enormous sensitivity and panache. Their program is beautifully varied, with something for just about every taste. This 2-CD treasure trove is just the latest evidence that Mimi Stillman and DSE are a major force for good on the American music scene. I can just see American composers all over this country polishing up their flute pieces now, ready to send them off to Philly. They, and we, couldn't ask for more brilliant, more dedicated advocates." "Mimi Stillman's 'Odyssey' is a must-hear for any serious concert flutist in search of repertoire or contemplating recital programming, being a generous double-disc offering of first recordings by eleven American composers. There are many treasures here, including some precious discoveries for all tastes and musical inclinations -- I am finding that repeated hearings yield new favorites. Given Stillman's flute prowess, impeccable virtuosity, focus and musicianship, matched by her pianist/collaborator Charles Abramovic's consistently strong performances, it comes as no surprise that 'Odyssey' is one joyous ride indeed. It should be savored by musicians and listeners alike." "This is a great collection to have; I could easily program my next recital solely from these selections ... Zhou Tian's jazzy Duet sounds so natural on both instruments, I'm sure the players enjoyed themselves tremendously in recording it ... From the initial dark and dense piano chords, Andrew Rudin's Two Elegies gripped me all the way ... Stillman performs these pieces with great sympathy and ability." "Stillman and Abramovic perform with beautiful craftsmanship, giving each movement the distinct flavor that Hoover intended ... Stillman and Abramovic perform brilliantly throughout the recording. They commissioned and premiered several of the works, and thus play each piece with a wonderful sense of ownership. With nearly two hours of music and relatively limited instrumentation, the duo eloquently communicates each composition’s unique mood and each composer’s individual voice." "[A]n abundance of color and texture all within the parameter of the solo flute line that is truly remarkable. … The highest level of artistry holds true for all the works for flute and piano. I was overwhelmed by the sensitive playing and the colorful, expressive, and rich sound created by Stillman and Abramovic in their artistic collaboration."